Four Reasons to Use a Rear Facing Car Seat Longer! When we had our daughter four months ago, we had to dig up our rear facing car seat again and get it set up in the car! They don't normally even let you leave the hospital until they see it is installed right and you have one! Here in the United States, a rear facing car seat is the norm for at least the first year or at least 20 lbs. The American Academy of Pediatrics and other Child Passenger Safety organizations ACTUALLY recommend keeping your child rear-facing as long as possible, at least until they are 2 years old and preferably up to maximum weight/height limits of their convertible carseat. But as parents, a lot of times we are rushing to get them into a front facing seat for convenience, the happiness/contentment of our child in the car, or because we feel it makes them seem older or more advanced. So why is it recommended to wait??? As parents, we know that it is definitely not easy to keep children rear facing! Children tend to not like the rear facing position most of the time but it truly is the safest position and, for me personally, I just have to tell myself over and over how safe they would be if we got in a crash (while they are screaming like crazy in the backseat)! 1. Rear-facing car seats spread frontal crash forces over the whole area of a child's back, head and neck; they also prevent the head from snapping relative to the body in a frontal crash. A baby’s head is relatively large in proportion to the rest of his body, and the bones of his neck are structurally immature. If he’s rear-facing, his entire body is better supported by the shell of the car seat. When he’s forward-facing, his shoulders and trunk may be well restrained, but in a violent crash, his head and neck can fly forward. 2. Rear-facing carseats may not be quite as effective in a rear end crash, but severe frontal and frontal offset crashes are far more frequent and far more severe than severe rear end crashes. 3. Rear-facing carseats are NOT a safety risk just because a child's legs are bent at the knees or because they can touch/kick the vehicle seat. 4. Rear-facing as long as possible is the recommendation of the American Academy of Pediatricians, and can reduce injuries and deaths. Motor vehicle crashes are the #1 overall cause of death for children 14 and under. So how does the rest of the world view rear facing seats? In the USA, this recommendation is valid through the 35 or 40 pound maximum rear-facing weight limit of most convertible carseats, or until the child outgrows their convertible carseat by height. In countries like Sweden, children are often kept rear-facing much longer, even to 3 or 4 years old. 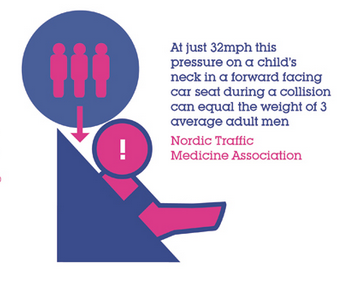 Auto related injury and death rates for rear-facing children in Sweden are near zero because of this! However, in countries like the UK, rear facing seats aren't the standard. Thankfully, they are trying to change that with great rear car seat facing campaigns like rearfacing.motors.co.uk that are educating the country on why to pick a rear facing car seat! So next time you are tempted to change your child over to a front facing seat to interact better with them or make them happier in the car, make sure they have hit 35 or 40 pound or at least two years old! You will thank yourself if you ever get in a car crash!